Salsa adds extra zip to this chicken salad! 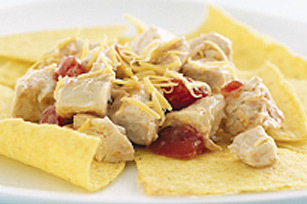 Mix chicken, salsa, cheese and dressing in small bowl. Spoon mixture onto tortilla chips. Enjoy with a serving of black beans or brown rice and a side salad. For a veggie boost top with shredded romaine lettuce and chopped tomatoes.